I wanted to spend a little more time on the Fox News piece I poked fun at yesterday, because it reflects the kind of blinkered ahistorical view about Iran that gets a lot of play in the right-wing media, and virtually no pushback from the actual media or the left. The writers of the piece, Maryam Rostampour and Marzieh Amirzadeh, wrote a book that the “let’s do war on Iran” crowd loves, called Captive in Iran: A Remarkable True Story of Hope and Triumph Amid the Horror of Tehran’s Brutal Evin Prison, which I have not read but I’m sure their story is tragic and horrific, because the clerical regime in Iran is brutal and thuggish. Rostampour and Amirzadeh were apparently imprisoned for handing out Bibles and proselytizing, and while I wouldn’t want somebody waving their holy book in my face personally, no modern, civilized nation should imprison and mistreat anyone on the basis of what they say or believe. So they have my utmost sympathy for what they’ve been through and my complete agreement that the men (just men, let’s be real here) who put them through it did so in the service of a vile, backward regime. But you know who built Evin Prison in order to torture and confine his political opponents? It was the silly-looking dude (dud?) in the portrait there, Muhammad Reza Shah Pahlavi, the man who made the current Iranian regime possible by simultaneously being an incompetent ruler and a ruthless thug. And nobody knows or remembers this, because we don’t like the current regime, ergo the guy they overthrew must have been a Good Guy, right? He was certainly good to the West, western oil companies in particular, but sadly, no, not a good guy. Sorry. Let’s talk. Muhammad Reza Shah Pahlavi came to power in 1941 as a side effect of Hitler’s decision to break the Molotov-Ribbentrop pact and invade the USSR. Reza Shah Pahlavi, Muhammad’s father and the ruler at the time, had already declared Iran’s neutrality in World War II, but Iran and Germany had close historic ties and the British feared for the safety of their oil interests there while the Soviets feared having a Nazi satellite on their southern border. What’s more, once the Nazis moved east the Allies determined that the most reliable way to ship supplies to the USSR was via the Trans-Iranian Railway from the Persian Gulf through the Caucasus. Iran and Russia were historic enemies anyway, so all it took was Reza Shah’s refusal to expel Axis nationals in Iran for the Allies to act, and in late August they invaded Iran from the north and south. A month later Reza Shah was in forced exile and his son was installed on the throne, a concession made to hasten Reza’s ouster. While Muhammad publicly was a reluctant ruler and expressed admiration for his father, privately it’s likely he was happy to see dad go. Although Reza Shah had been something of an autocrat himself, the Iranian political system had been set up in their 1906 constitution as a constitutional monarchy, and for the first part of Muhammad’s reign it seemed as though this was the direction the country was taking. The Parliament (Majlis) had real authority, and a series of prime ministers governed the nation, ultimately beholden to the shah as monarch but with a great deal of autonomy. Then came the coup d’etat against the elected government of PM Muhammad Mossadegh, instigated by US and British intel outfits over Mossadegh’s move to nationalize Iran’s oil industry. This looked suspiciously like Communism to the West, and they assumed Mossadegh was on the take to the Soviets. America and the Brits in the 1950s assumed that any foreign leader who wasn’t on the take to them was, ipso facto, on the take to the Soviets. The details of the coup and how it affects Iran’s relationship with the West today are fascinating, but not the point of this particular piece. What we care about is the aftermath, when Muhammad Reza Shah Pahlavi, who had fled the country after an initial attempt to overthrow Mossadegh failed, returned, but now as an absolutist autocrat instead of a constitutional monarch. Over the next five years the Shah’s men rounded up any dissidents they could find, particularly from the Communist Tudeh Party (a sloppy kiss to the Western Powers who had put him back in charge); thousands were arrested and hundreds killed or imprisoned for life. Political parties were severely curtailed, though other than Mossadegh’s National Front and Tudeh they were not outlawed, yet. This was meant to insulate the Shah from the charge of being a dictator, because if he were a dictator, he said, then he’d establish “a single dominant party such as Hitler organized.” Which, of course, he did, in 1975. The Shah was fond of defending his autocracy with pithy quotes like “when Iranians learn to behave like Swedes, I will behave like the King of Sweden.” You can imagine the Iranian people just loved that kind of talk. The Shah formed a new secret police unit in 1957, the Saziman-i Ittila’at va Amniyat-i Kishvar (“The Organization for Intelligence and National Security”), or SAVAK. An Iranian writer named Houshang Golshiri wrote a short story called “The Man with the Red Tie” (available in translation), from the perspective of a SAVAK officer tasked with following and reporting on a man whose greatest crime against the state is apparently wearing a red tie that doesn’t match his suit. It’s a fantastic description of the absurdity of being an agent of the secret police, paranoid, self-loathing, yet utterly enmeshed in the tedious, mundane details of your targets’ lives. Savak spent the 22 years between its formation and the Islamic Revolution censoring the press, torturing dissidents (occasionally to death), compiling dossiers on anyone and everyone that could then be used to screen candidates for government jobs. Simin Daneshvar, for example, was prevented by SAVAK from working as a professor despite her obvious gifts as both a writer and teacher, because she and her husband Jalal Al-i Ahmad, were deemed to political. In 1971 SAVAK took on another role, suppressing armed guerrilla uprisings, and were so brutal at it that officers were sent abroad to learn less lethal forms of torture. One of SAVAK’s premier facilities was the aforementioned Evin Prison, in a neighborhood of Tehran. By 1977 Evin held 1500 political prisoners, a number that grew considerably larger after the Revolution, when the clerics gratefully took over operations at Evin and continued to use it for political repression. Estimates of the number killed and/or tortured by SAVAK over its 22 years are in the thousands. On the plus side, Iran’s economy improved. Three cheers for the shah, except that the economy was only in the toilet in the first place because the Brits had led an effort to impose an embargo on Iranian oil, so when they lifted that it would have been shocking had the economy not improved. In exchange for allowing more foreign access to Iran’s oil, the oil companies agreed to paying higher taxes to the Iranian government, so oil revenues shot up. 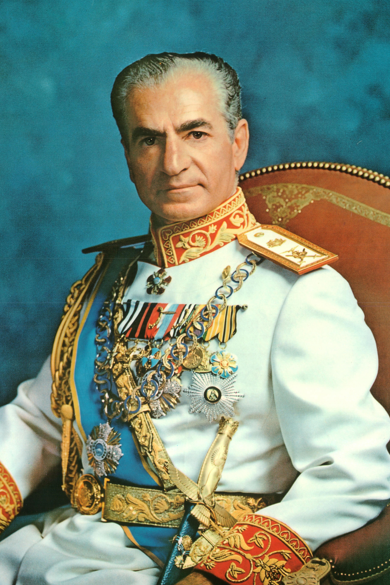 The Shah implemented his so-called “White Revolution” in 1963, which was an effort to distribute some of the country’s windfall oil profits to the middle and lower classes, via land reform, welfare programs, and infrastructure modernization projects, and accomplished some good things, like women’s suffrage and improved public health and education. But the privatization schemes that went along with the other reforms only created corruption and additional inequality, not the “trickle-down” effect he’d hoped, so the major accomplishment of the improved education system was that a whole lot more folks in the lower classes were now educated enough to know that they were getting screwed by the political and economic system. When the rebellions began in the mid to late 1970s, the Iranian officer corps, which by then existed only as a patronage house for the shah’s best and wealthiest pals, decided to respond not with riot gear but by indiscriminately shooting live ammunition into massed crowds of protesters. The violence ended any chance of reconciliation between the shah and the protesters, and effectively sealed his fate. So when folks like Rostampour and Amirzadeh start off Serious Pieces About the Iranian Menace with sentences like “Since the Iranian Revolution in 1979, elections in Iran are a symbolic game,” I want to tear my hair out, because what do they think elections were like before that? What do elections mean under an autocrat whose secret police harshly limit political dissent and elected officials have little autonomy anyway? Believe me, I get that the current regime in Iran is awful, but let’s not pretend that the last one wasn’t awful too. Very interesting post. We have a tendency over here to look at guys like the Shah and so many other horrible dictators as “good guys” just because they’re friendly with our elites and because the media plays them off that way. In the end, there’s really not much difference between the Shah and the Supreme Leader: they’re both bastards. I don’t know…. except maybe for these two writers, I highly doubt anyone believes the Shah now is the good guy. He has always been an embarassment to the west that had supported him.